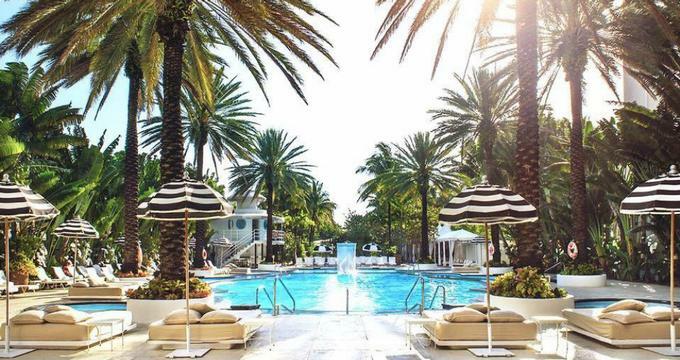 The Raleigh Hotel in Miami Beach is an iconic getaway that exudes the grace and glamor of a bygone era. Built in 1941, the streamlined art deco landmark is situated on the bustling Collins Avenue in the vibrant neighborhood of South Beach hotel and is within walking distance of many shops, restaurants, bars, nightclubs, and other entertainment. Blending a classic beach style with contemporary accents and modern touches, well-appointed themed guest rooms and suites have stylish décor, comfortable furnishings, modern amenities, and garden terraces or balconies with beautiful views. The hotel features a palm-lined swimming pool made famous by Esther Williams, an on-site restaurant serving creative American cuisine, an elegant cocktail lounge and bar and private access to Miami’s South Beach. The Raleigh Hotel offers bikes for rent to explore the area and is within a short drive from the Miami Art Museum and other attractions. The Raleigh Hotel feature stylish and sophisticated guest rooms and suites in artistic art deco hues with contemporary décor and furnishings, king or queen-size bed with fine Egyptian cotton sheets, down comforters, and en-suite bathrooms with walk-in rain showers, deep soaking tubs, plush towels, bathrobes, and slippers, and branded bath amenities. In-room conveniences include flat-screen televisions with cable channels, sound systems, clock radios and iPod docking stations, mini-fridges, coffeemakers, irons and ironing boards, hairdryers, telephones with free local calls, and complimentary wireless Internet access. Additional guest services include daily newspaper delivery, automated wake-up calls, and daily housekeeping services. The exquisitely-appointed Esther Williams Suite is 990 square feet in size and boasts a spacious living room with sumptuous furnishings and a dining table for six guests. A master bedroom has a king-size bed with deluxe linens, and a marble en-suite bathroom with a deep soaking bathtub, double rain shower, plush towels, bathrobes, and slippers, and branded bath amenities. The luxurious suite has gorgeous views of the legendary swimming pool. The Restaurant at the Raleigh serves innovative, Modern American cuisine with global-inspired touches and an extensive menu of fine wines, artisan beers, and handcrafted cocktails served in a relaxed, elegant setting. The Martini Bar is a stylish, beach-inspired bar that offers a modern take on classic mixology and serves an extensive list of signature cocktails, spirits, and other colorful libations. The Pool Bar is a timeless Art Deco watering hole next to the hotel’s iconic swimming pool that serves complimentary chilled towels and handcrafted cocktails, and the Coffee Bar serves a range of imported coffees, teas and other beverages and light snacks. In addition to stylish guest rooms and suites with breathtaking ocean views and deluxe conveniences, luxury amenities and facilities at the Raleigh Hotel include a legendary palm-lined swimming pool made famous by Esther Williams with sun loungers, umbrellas and private, fully serviced cabanas with direct beach access. The Restaurant at the Raleigh serves innovative, Modern American cuisine, while the Martini Bar serves an extensive list of signature cocktails other colorful libations. Other amenities and services include bicycles to rent for exploring the neighborhood, an array of concierge services, including dinner and tour reservations, 30,000 square feet of versatile indoor and outdoor venues for functions and events, and in-room spa and dining services. The Raleigh Miami Beach 30,000 square feet of versatile indoor and outdoor venues, including an iconic swimming pool, private beach and luxurious penthouse and private beach, for special celebrations such as weddings, ceremonies, and receptions, as well as corporate meetings and business gatherings. The hotel features modern event spaces of varying sizes to suit every occasion with state-of-the-art audiovisual equipment and premium services such catering, music and entertainment, floral arrangements, décor and cakes and more. A professional event planning and management team is available to ensure the function or event runs smoothly.